To register, click on the 'Register' button located on the top right corner. The box with a form will appear after the click. Fill in the required fields and accept the terms of service. Finally, click on the 'Register' button. 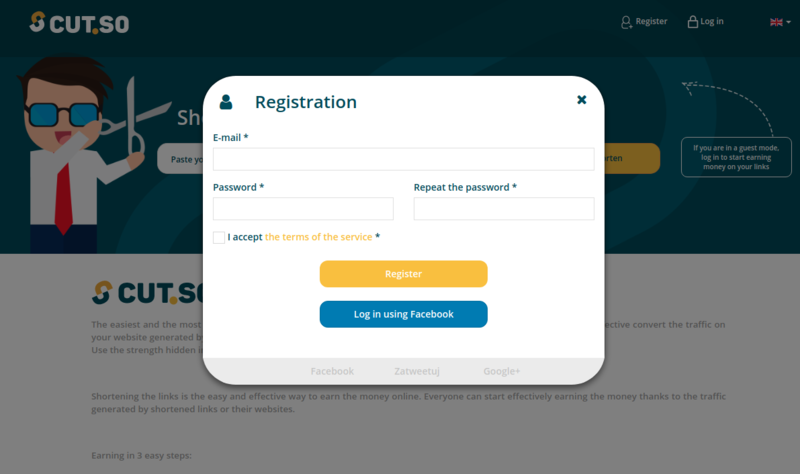 You will receive a message that the account has been created correctly and you need to activate it. All the data that are required to activate your account will be sent to your e-mail address. You can also log in to your system using your Facebook account. To do so, click on the 'Log in using facebook' button and enter your login information. After verification and approval of the data (e-mail, name) from the Facebook account, you will be able to use our service. Once you have completed and approved the registration form, you will receive an activation message to your mailbox. There is the activation link in the message. All you have to do is to click in the link. You will be redirected to the website and your account will be activated. If you can't click on the link in the message then copy and paste it to your browser. You can earn money by promoting our system. All you need to is someone who will sign up in our system using your referral link and you will receive a commission from this user's earnings. To copy the referral link, go to `Referral Program '. You can also place an ad on our site. Choose the ad size that you are interested in, copy it and paste it to your website. Shortening links is very easy. 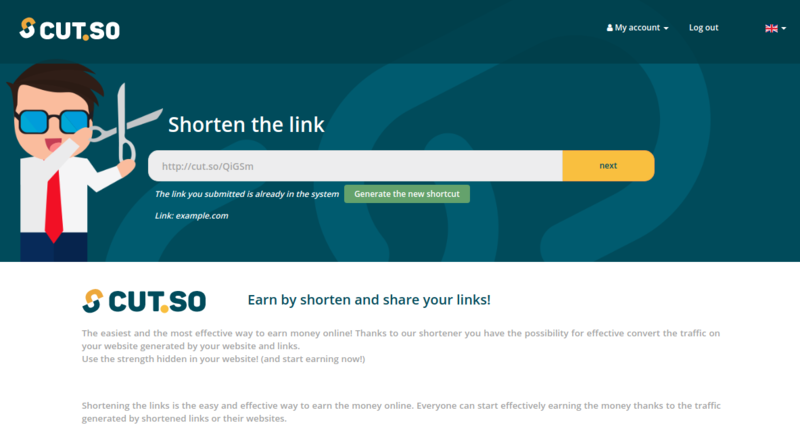 Enter the link you want to shorten into the text field at the top of the page and click `shorten'. A short link will appear in the text box - you can freely share it. 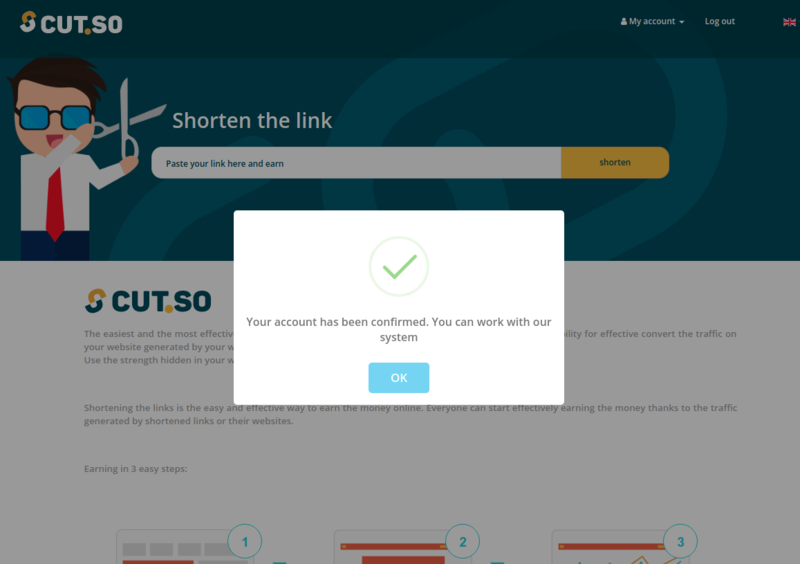 If you want to shorten the same link again but get another shortcut, you have to log in and enter the link to the text field just like in the case of usual shortening. If you shorten the link that exists in the system, you will see a message under the text field and the button `Generate the new shortcut`. Click the button if you want to create a new shortcut. Remember that this is not editing the previous shortcut, but creating a new one. The previous shortcut still will be active and will redirect to the specified page. In order to generate our script you have to select the option and click the button of the selected option. Important: options can be combined, you do not need to generate a few scripts. When you select the option, the configuration window will appear. Customize the option to your needs and click `Save Settings`. All options are described in the configuration window. The script that is ready to be pasted into the website will be generated automatically. 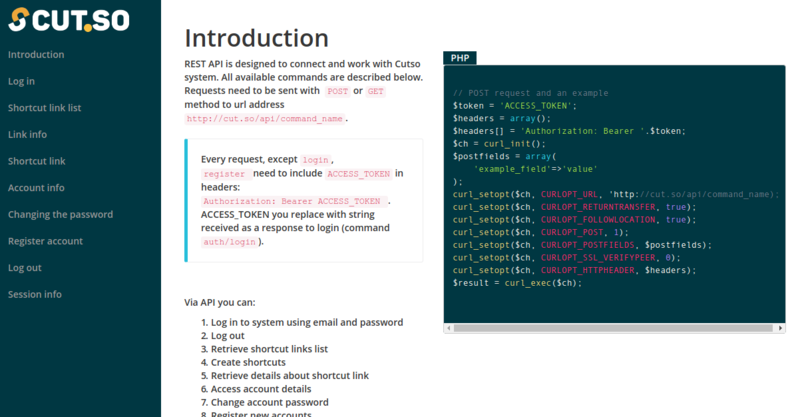 We provide API for all system users. The whole documentation is under the link here. 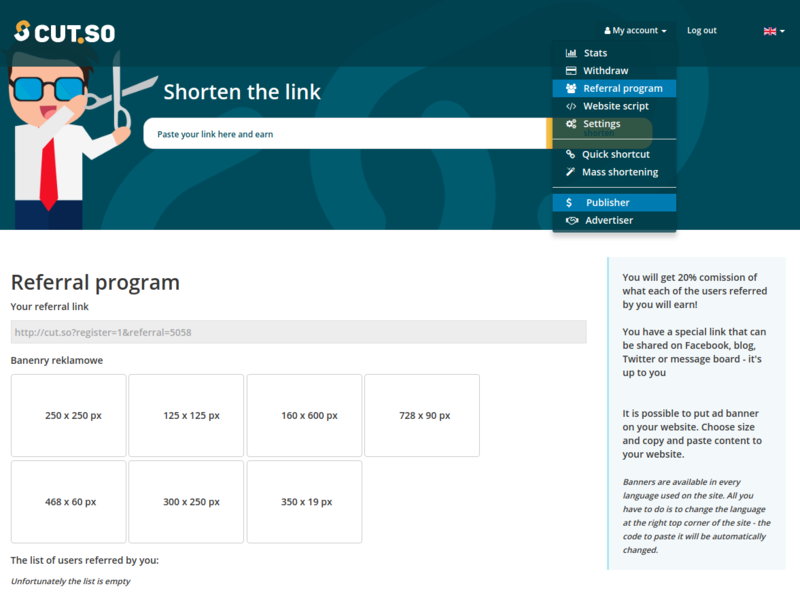 In our system, we have many tools to help you shorten your links. One of them is 'Quick shortcut '. 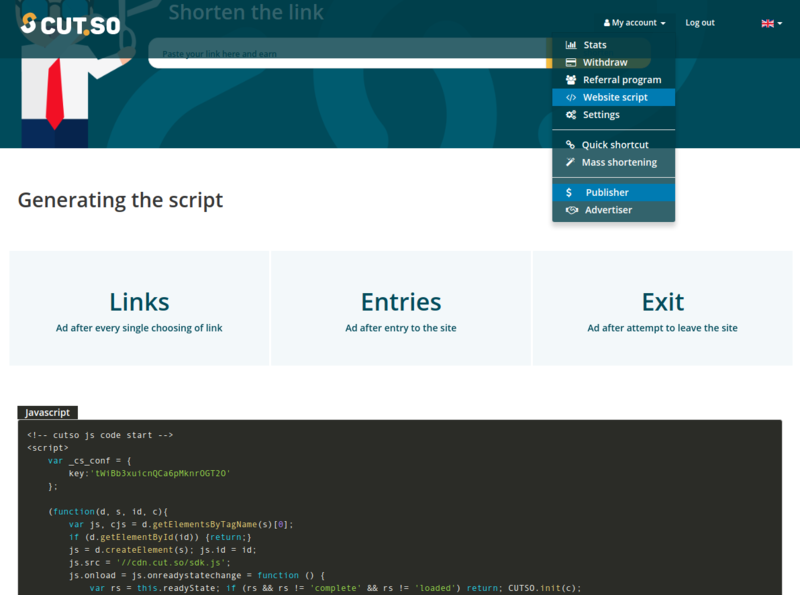 This tool is used to generate links without the use of API, webscripts, or hand-generated shortcuts. 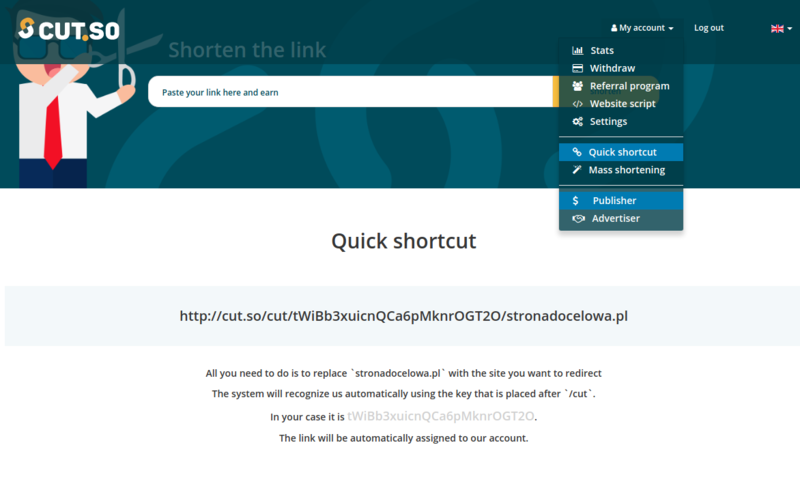 Just go to `Quick shortcut 'and replace the target page in the text` stronadocelowa' and the link to share is ready. The link will be automatically identified by the key from the link. Double ad means 2 times more impressions. The user clicking on 'Skip' will be redirected to the next ad window. Double ads can be set in the client panel in settings. Check the box labeled 'Allow double advertisment' to make profits of double impressions. Unfortunately, impressions of users the programms like `Adblocker` enabled are not billed. 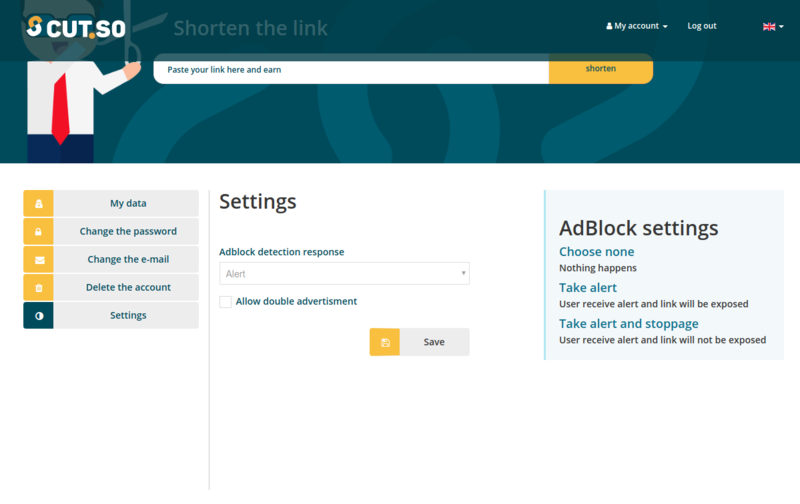 It is possible to force the user to disable the `Adblocker` program or to display a notification asking to disable it. The reaction at detection of the `AdBlocker` type programs can be set in the account settings. If you have a list of the links and you don't want to type every each of those links in the text fields on the home page, use mass shortenings. 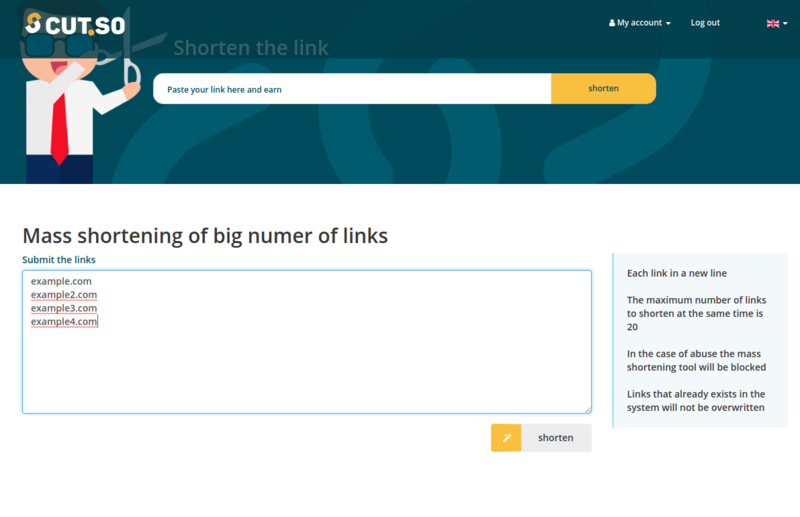 This tool makes it easy to shorten the list of links at once. 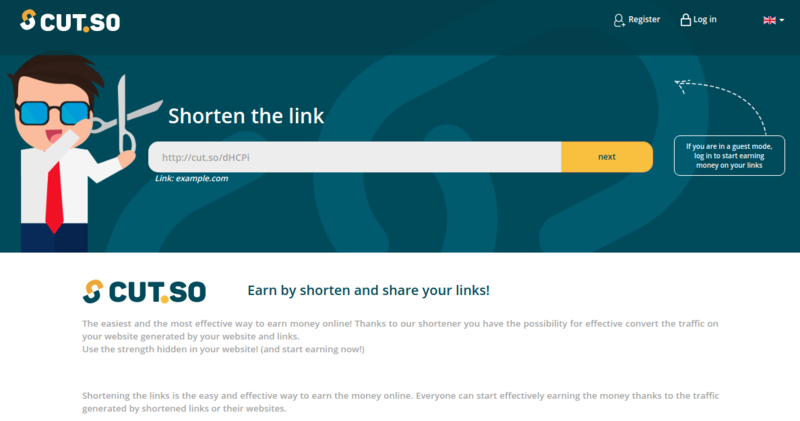 Enter each link separately (up to 20) and click `shorten`. Payouts are made automatically. You only need to enter the billing informations and your account balance must exceed the minimum. You can enter the billing information in your account settings. The details about the withdrawals and the settlements you have made can be found on the 'Withdrawal' tab. 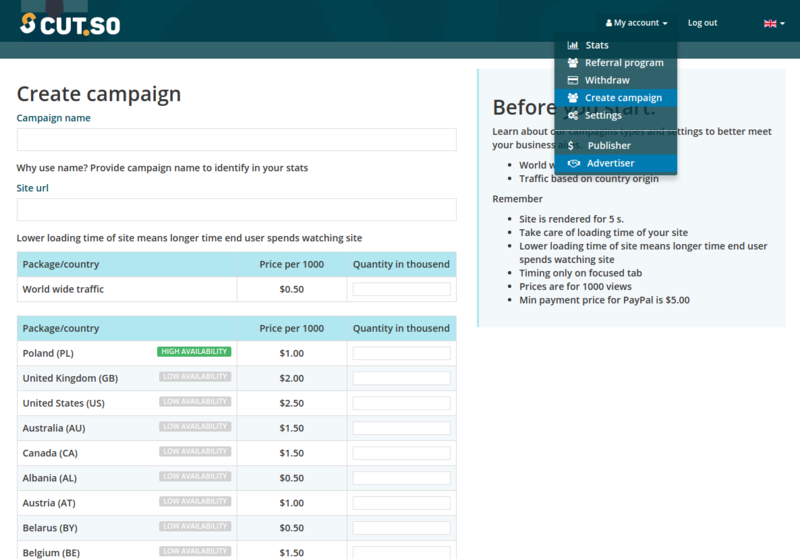 To create a campaign, click the 'Create campaign' button and fill out the form fields. You must specify the campaign name and the url from which the content in the ad view will be displayed. You need to take care of the fast loading of the website. If the loading time is too long, the end-user may not see displayed page. Once you have entered the name and address, select the number and type of packages. 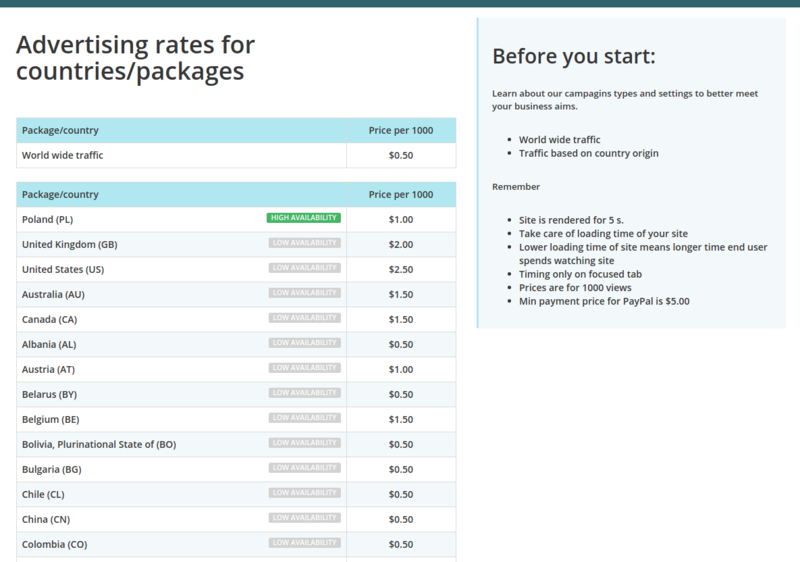 There are either global or country-specific packages. For each country, we label the impression availability label within our system. 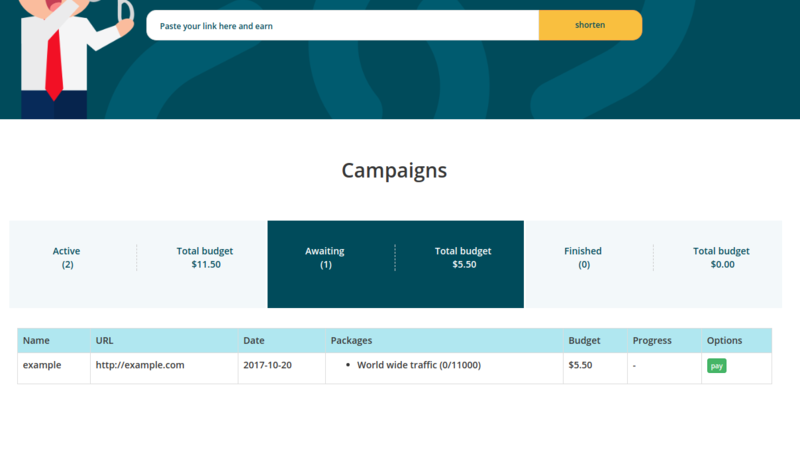 Before creating a campaign, make sure that you entered the billing information. If the data is entered, click go to payment. Payments can be made within your own wallet or using Paypal. Payments from the wallet are processed immediately. For PayPal payments, the waiting time will increase slightly (to the moment the payment confirmation is received). In case of error in payment (caused by different types of reasons) you can return to the payment in Campaign Stats and pay for the chosen bonus. If you have any problems, please contact our Customer Service. 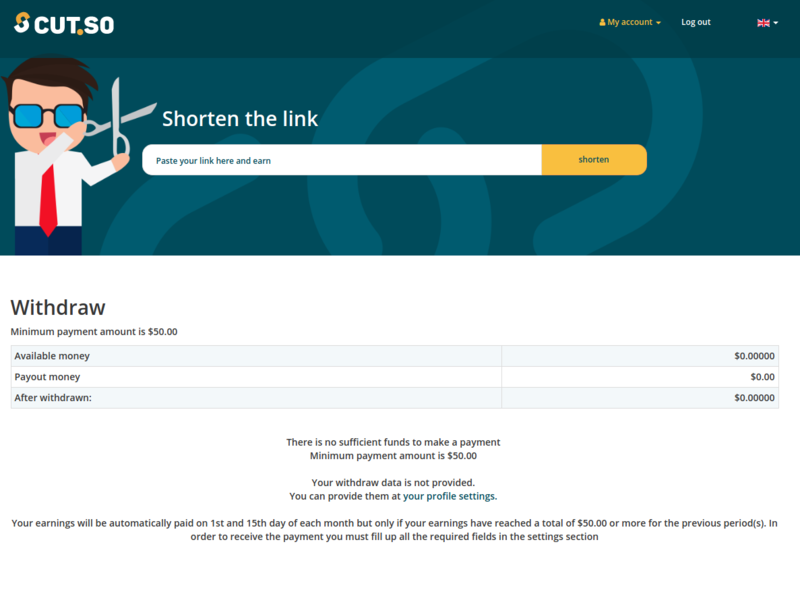 Each payment is settled and the user is notified by email. Pay special attention when filling in the data for settlement. If you have any problems or questions, please contact our Customer Service.